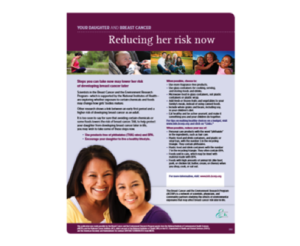 You are encouraged to use the materials in this section to raise awareness among parents and caregivers about steps they can take now that may lower a girl’s risk of developing breast cancer when she is an adult. Most of the materials are in a format that can be adapted locally. As one example, the toolkit for African-American parents and caregivers is a modification of the original materials developed for parents and caregivers. 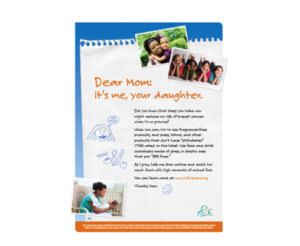 It uses the same text as the original materials however, the African-American toolkit contains photos and other images that are more relevant to African-American parents and caregivers. 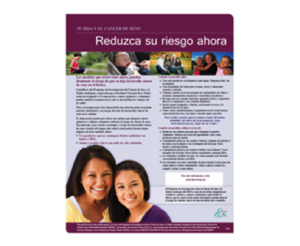 Another example is the translation of the BCERP brochures and flyers for Spanish speaking populations by BCERP members in Wisconsin. Individuals and organizations may wish to tailor the wording and/or images in these materials to better meet the needs of local populations. To assist with this adaptation, we have developed a set of guidelines for tailoring the BCERP materials for use in your local community and we provide links to text-only versions of the English and Spanish content. These materials are based on scientific findings and may need review by someone familiar with breast cancer research if altered significantly from the original. 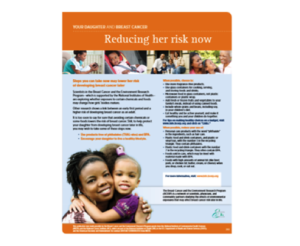 These brochures give an overview of the possible connection between environmental exposures early in life and an increased risk of breast cancer for anyone who has a young daughter or cares for a young girl, is pregnant, or is considering becoming a parent. It also provides suggestions on steps that can be taken that may help reduce breast cancer risk later in life. This 8×11″ double-sided piece is meant to be folded in half. There is space on the back of the brochure where outreach organizations may add their name, logo, and contact information. This additional information may be added by stamping the information onto the back of the brochure, attaching a pre-printed label, or editing the electronic file using software such as Adobe Professional. This letter-sized flyer provides a one-page overview of the material for anyone who has a young daughter or cares for a young girl, is pregnant, or is considering becoming a parent. Space has been provided so that organizations may add their name and contact information, or enter in additional information, such as details about an upcoming event. This is an 8×11″ advertisement with basic information that can be used in newspapers, local magazines, and newsletters. The file can be made larger or smaller by using Adobe Acrobat or other graphic software. 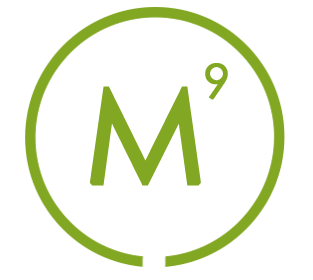 There is space at the bottom of the advertisement where outreach organizations may add their name, logo, and contact information. Because this is a Public Service Announcement (PSA), which has information that can benefit the local community, publications are often open to running these without charge. Try approaching a publication’s public affairs reporter, local news editor, health or science reporter, or community editor.